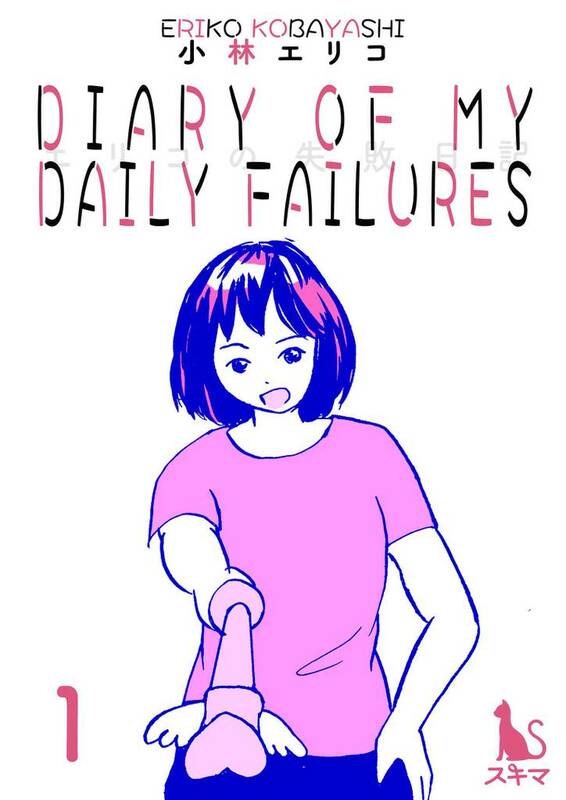 Diary of My Daily Failures(Eriko Kobayashi) Review｜MANGA.CLUB｜Read Free Official Manga Online! Reminds me of the korean comic about the girl who had depression but not as bad as the korean one on lezhin comics. Not a fan of this one too much. It's not bad, but nto a fan. This manga looks cute before you read it, but is very dark and sad. You may cry reading this, but I do recommend it. The multitude of sides depicted in this manga is fascinating. Especially when depicting an illness like depression, there are so many ways to go about it and the author covers a number of them, like social life and going to work is affected by depression. The shadow/cloud chapter was especially well done. This series is an autobiography of the author's experiences with depression and delusions. The added bonus to this title cones with the realization that her perceived failures are even pointed out in her own work. While the art is very vibrant for the subject matter as far as her choice of colours, I feel like the art in this series works to take the edge off. Yes, it's bright and saturated, but isn't depression the polar opposite? Honestly I clicked on it because it seemed intriguing, I wasn’t really sure what it was about and what I expected of it ... Then I started to read, and wow that’s really good. I really like the concept of colorful and kinda cute drawings being a canva to a story about depression- that makes nice and interesting contrast. The story itself is really sad and leads to some reflection (maby it’s just me). I clicked Diary of My Daily Failures expecting a something quick and comical along with some deep meaning lightly layered in. From the simplistic cover art, I expected something in a 4koma style or near textless story telling. The colors added to the simplistic art is a welcomed bonus, providing better visuals (to me) for reading fast. But the amount of text crammed into each panel does the opposite. (Not a fast read!) The content reads like some graphic memoirs/biographies I've tried reading before and those bored me. This is quite a engagingly quirky way the mangaka details with a serious topic of mental health. I like how this sort of dark story is off set with the bright neon colour, contrasting the situations really well. A subject that a lot of people are uncomfortable talking about. I very much appreciate seeing a manga presenting it without reservation. This is a beautiful story, I see the author as a very brave person to be able to write about her self and her own struggles. Even if the art is not sharp, it does not matter because the plot flows through the point of view of the main character and that is what the author is trying to accomplish. For the reader to be able to see through her eyes. It's always interesting when artists decide to write comics based on themselves and their life experiences. Especially ones who are dealing with depression or other mental health issues, allowing others to know they're not the only ones out there or giving people a better idea of how it feels and how it affects them. thought it be more comical but it's more serious and closer to an actual biography in comic form. Interesting read. It takes a lot to be able to openly share your experiences like this, especially the darker ones. The story here is heartbreaking but interesting to read. I haven't struggled nearly as hard as the creator but I know others out there have, and I hope this creator's work will be able to reach those folks and help them in a time of need. I thought the art style was very pretty as well, and reading about other people's experiences like this can be quite eyeopening. I definitely suggest people give this a read. Personally I think it’s really great of the writer to be able to write down her experience to share with others. I know people tend to experience these issues in different ways but someone talking about it is helpful to others going and dealing with their own. Also it’s interesting to get to see how different countries handle the issue of treating mental illness since different cultures tend to look at it differently. I hope the writer continues her work it’s a really great read so far. As someone who has mental health issues and struggled with suicidal thoughts and self harm, I find it comforting to see someone talking about it in a means I'm comfortable with. Manga makes things that are difficult more digestible. Not many people talk about extreme mental health situations and life after them. I hope that the writer continues to share and that she can find her own happiness with her mental illnesses. I know I've been struggling with mine for years, I still am struggling, so find stories like this helpful, because it means I don't have to hate myself for my failures. Because I don't hate the writer for her problems, I want her to be happy, so maybe it's okay to not be angry at myself. I hope she eventually learns to love herself and hopefully doesn't want to die anymore. I know that is hard, personally I haven't reached that, I still see mental health professionals and I haven't reached that point. I just don't know. The reading is so weird but down to earth. Interesting read but from time to time relatively depressing. Definitely something everyone should read, especially if you're curious how mental health is handled in Japan. It's sad, but I want to read more about Eriko. I am so glad Eriko shares these stories, but I hope that someday she doesn't suffer from depression anymore. An interesting look at how mental health is dealt with in Japan. As someone who has a relative who is diagnosed with depression, parts of the manga hit close to home for me. The artwork is a bit clunky in some parts, but it fits the tone of the story. This is a really appreciated show on how mental health is dealt with in Japan, It also hits close to heart. The colors are great and the mood through writing sets the tone well. I started reading and it got me hooked pretty much immediately. I don’t like overly dramatized stuff and gladly this is not such - it’s actually credible and therefore really interesting. It was hard to read because even though it was dealing with her life in a matter of fact manner and with no self pity, the art and the manner in which the comic was set up and drawn made it very unenjoyable to read. But mad props for writing about this. This is a really open telling of a young woman's journey through mental health institutions while dealing with extreme depression. The tone is very matter-of-fact and lacking in self-pity - which makes it less stressful to read in the moment, but also sadder, beneath the surface. The art is somewhat amateurish, but in the way a lot of small-press indie comics tend to be. But this isn't too distracting, because the art style is still expressive and pleasant. The colors are also great: so stark and bright that they're JUST this side of unnerving instead of cheerful. Overall a very sincere, raw, well-written comic that I intend to keep up on. The scrolling webtoon format serves it well, but I'd love to see this turned into a physical book.